Nichols School is an independent, coeducational, college preparatory day school serving grades 5 through 12. Located in Buffalo, N.Y., Nichols is non-denominational, with 570 students from across Western New York and Southern Ontario, as well as several international students. The dedicated faculty is focused on preparing students to thrive in the global community of the 21st century. Nichols provides access to challenging academic programs, and extensive athletic, art and cultural exchange programs. Through leadership opportunities and community service projects, students develop strong work ethic, integrity, character and personal responsibility. 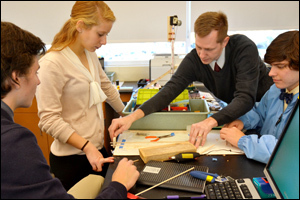 Founded in 1892, Nichols is accredited by the New York State Association of Independent Schools. Visit www.nicholsschool.org.